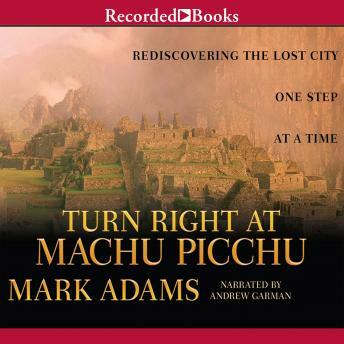 Listen to "Turn Right at Machu Picchu: Rediscovering the Lost City One Step at a Time" on your iOS and Android device. Writer for the New York Times and GQ, Mark Adams is also the acclaimed author of Mr. America. In this fascinating travelogue, Adams follows in the controversial footsteps of Hiram Bingham III, who's been both lionized and vilified for his discovery of the famed Lost City in 1911-but which reputation is justified? The audiobook seemed to skip chapters though without detracting from the story. Get a map or at least Google the map of the machu pichu area so you can visualize his and bingham's expeditions. I will be traveling to Peru in June and hiking on the Inca Trail. This book was terrific with getting prepared. Great stores, I know I will listen to it again! !